Another Alternative Learning System (ALS) class again was launched recently in Marcelo Aguirre Sr. Village or MASVILLE, Btgy. Cubay, La Carlota City. 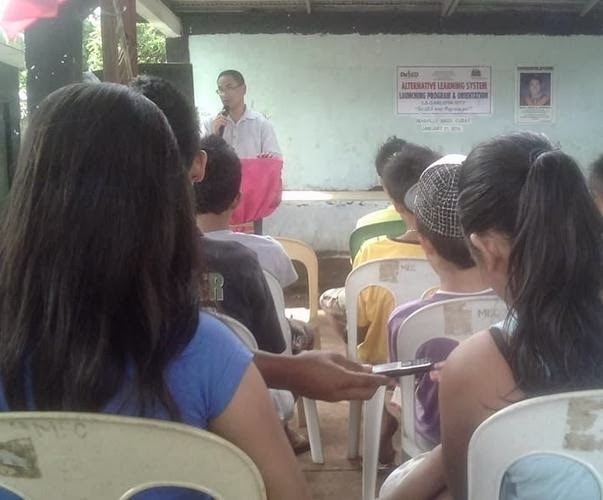 Sir Chester John Baran, district ALS coordinator, was assigned to teach the learners. He invited in his launching program, that is to challenge the learners. Since Masville belongs to Brgy. Cubay, ALS monitoring is one of my supervisory activities. I didn't want to miss the special occasion. However, I had an important matters to look into and it overlapped my activity that day, therefore, I couldn't make it. 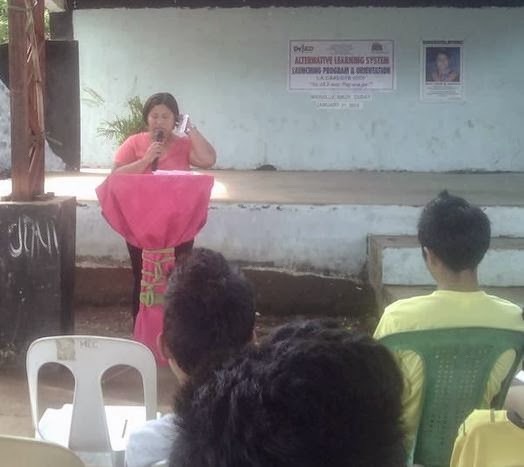 So in my behalf, I delegated one of my teachers, Mrs. Melanie C. Reyes to read my message which has posed four challenging questions to the prospective learners on how firm and strong they are in taking the ALS modular teaching to finish their interrupted formal schooling for a particular and practical reason. To the learners, I know that every one of you has the desire to be successful in the field of work you want to be, but due to circumstances which could be possibly beyond your control you're unable to fulfill such ambition. There is no time of blaming yourself or pointing of an accusing finger to anyone. What you are right now is a reality of such circumstances that had happened to your life. But, my dear learners it is not yet too late. You have still a big chance to reach your ambition in life by being educated through this system of learning offered by the Department of Education for the person like you. Let us recall the often-quoted statement of inspiration which in the passage of time has never ever been lost its effectiveness to those who have been disgusted, frustrated or even fallen countless time. And this statement says: “If there's a will. There's a way" or in another way of saying it, 'The quitter never wins"
1. Do you look upon yourself as a person who believes in himself? 2. Do you offer your available time to grow in all aspect of your life? 3. Do you verify things if you can't understand them? 4. Do you evaluate your mistakes why you've made them and rectify them appropriately? If all of your answer is in affirmative or yes, you have still deep in yourself the LOVE to be nurtured, to be trained, to be educated as a gainful and productive member of your family, of the society and of the country. There is no turning back anymore. What you are going to do is to press forward and hold on to the rod that leads to your happiness and even to eternal happiness if it is so. Time is precious. Don’t waste it. ALS is here for you. Take it and never leave it. I know for sure, you won't regret it at the end. It's good that we have ALS in the Philippines so out of school youth and other people who were not able to continue their studies before can have hope. I'm sure there are already a lot of success stories with the ALS program as it gives other people a chance at catching up on their education. ALS program in my opinion must be pursued, especially on remote areas where people needs it. very nice and inspiring sir. i totally believe that it is not too late for all of us! no matter what age we can still learn. like my husband is professor, his students are those business man or manager or owner of the company but still want to study! I want to go back studying as well when my daughter's school holiday starts. The ALS program can be a lifeline for people who are really interested in finishing their studies but have been prevented by personal circumstances. The ALS program stand to help many individuals who weren't able to finish their schooling.